The beautiful handcrafted stone pergola draped in seasonal flowers at this hotel is the most idyllic setting to commit to the one you love. 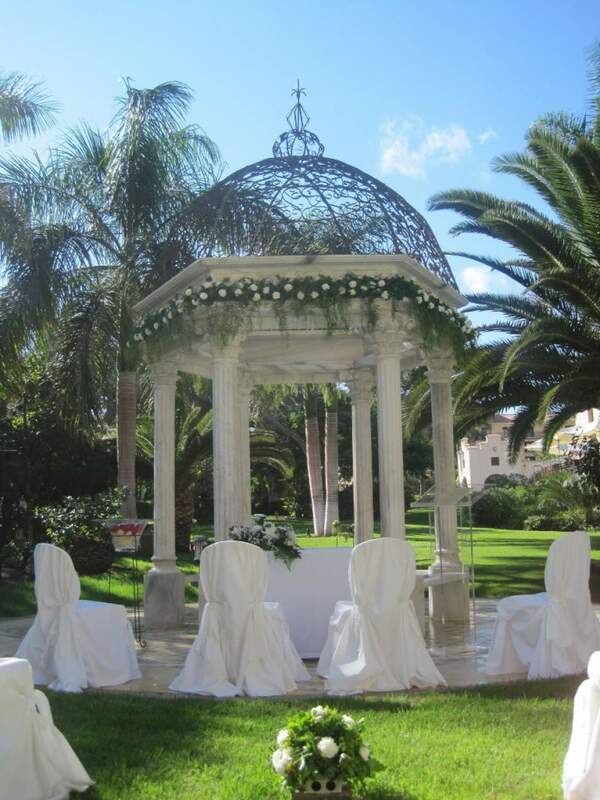 Surrounded by manicured gardens, romance, style and opulence are present in every corner. Imagine exchanging Vows in one of the most tranquil settings on the island. Sip champagne and wine at the welcome cocktail held the beach style infinity poolside bar while you watch the sun setting across the Atlantic Ocean. Whether you choose between a BBQ Buffet in the courtyard or an opulent dining experience in the Ambassador restaurant the hotel will wow you and your guests with their exquisite cuisine. The Brasserie will then host your evening festivities where you can dance the night away till 05.00h. With high standard hotel accommodation for you and your guests, not only will you have a spectacular wedding but everlasting holiday memories with your nearest and dearest. We love to talk weddings so why not give us a call or contact us and let’s see whether this great wedding venue could be the one you are searching for.